Replay Converter is an easy-to-use audio/video file converter and DVD/CD burner. Converts to and from 44 popular audio and video formats including iPod, WMV, AVI, Flash, MP3 and DVD. 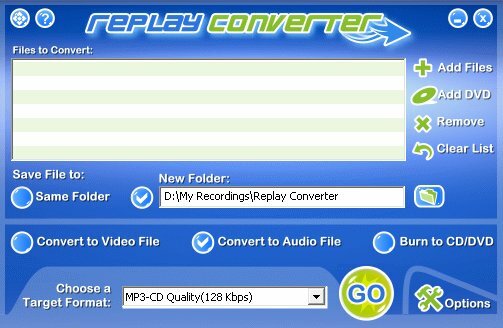 Replay Converter is easy to use: just pick the files to convert, choose an output format or DVD/CD disc type, and click "Go". Power users can customize the preset target formats. Works great with video and audio downloaded from the web. Install the free trial today! ...... download from web sites. You simply pick the files to convert, choose an output format, and click a button to start the process. Everything happens automatically. * Convert Video files to MP4, FLV, AVI, WMV and more for editing or playback on other devices. * Create iPod-friendly Video and Audio files. * Create MP3 files from Videos. * Replace or remove the audio track in a video. * Change the video track speed. Great for creating time-lapsed videos. * Extract a portion of a file to convert. Qweas is providing links to Replay Converter 4.07B as a courtesy, and makes no representations regarding Replay Converter or any other applications or any information related thereto. Any questions, complaints or claims regarding this application Replay Converter 4.07B must be directed to the appropriate software vendor. You may click the publisher link of Replay Converter on the top of this page to get more details about the vendor.